An employee of the ITS (International Tracing Service) researches documents at the Holocaust Archive on April 28, 2006 in Bad Arolsen, Germany. Jost has his patter down; he has begun to morph from chief archivist into tour guide. It’s a transition he never anticipated. 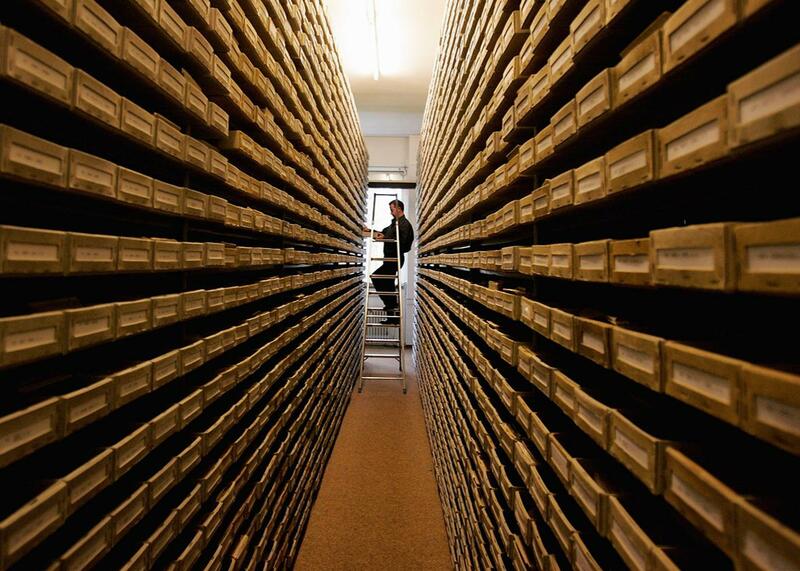 The International Tracing Service in Bad Arolsen, Germany, was, until late 2007, the largest unopened Holocaust archive in the world. For decades, historians have begged to get inside these doors, the source of years of diplomatic tension between the United States—prodded by the U.S. Holocaust Memorial Museum—and our European allies. Toward the end of the last century and the beginning of this one, it became the locus of hopes of survivors and researchers from all over the world, partly because no one really knew what they would find there. ITS holds some 50 million records. Sheltered in several buildings—once SS barracks—across a wide campus that recalls a New England liberal-arts college, the archives are located in a small farm village with a large palace, home to the fairy-tale-sounding character Prince Wittekind of Waldeck. (His godfather, staying with the period theme, was Heinrich Himmler.) By mandate, the archives were closed to research and outsiders beginning in 1955. That’s when the myths began. “Nobody knew exactly what was inside,” Volkhard Knigge, director of the Buchenwald concentration camp memorial told me in the summer of 2006, after the international commission controlling the archives finally set a timetable to open ITS at a meeting in Luxembourg. “It became … a place of imaginations, of fantasies.” We spoke by phone, I in Madrid, Spain, and he in Weimar, Germany. “Nobody knows exactly whether we will find—[for example] documents about decision making on the part of perpetrators or administrations of the crimes of the Holocaust. This archive became a kind of black box, and it invited people to create ideas about why nobody had access.” Some thought the mystery was Germany’s fault, he told me; others believed that the administrators were keeping “files hidden to let survivors die so that they cannot prove their right for financial compensation.” Because it was a European rather than a German archive, some claimed that other nations had something to hide—perhaps proof of collaboration. Still others voiced concern that European privacy laws—stricter in many cases than those in the United States—would be violated if the files were opened. The Bonn Accords mandated that the ICRC—considered an impartial institution—would control the files in Arolsen and that West Germany would be responsible for funding its operation. The holdings there were only to be used to trace survivors and victims—and to help families seeking restitution from the West German government. To alter that decree, 11 countries—Belgium, Britain, France, Germany, Greece, Israel, Italy, Luxembourg, the Netherlands, Poland, and the United States—would have to agree unanimously to open the doors. Israeli officials from Yad Vashem, the Israeli Holocaust memorial center, slipped in before the deadline to microfilm deportation lists from several concentration camps, but after that, the files were specifically designated to serve only those seeking family information or postwar victimization compensation. Under West Germany’s indemnity laws, victims had the right to pursue economic grievances against the German government for everything from being forced to wear the yellow star to death in a concentration camp. To obtain compensation, they had to somehow provide evidence of their experience—and a documentation file from ITS could do just that. In the 1960s, ITS puttered along. But eventually the archive began to falter at its only task—tracing victims. Some say the biggest problems began with the arrival of Charles-Claude Biedermann, a Red Cross official appointed to take over ITS in 1985, who ruled the barracks at Arolsen like a fiefdom. He hired only local farm kids—who, for the most part, didn’t speak foreign languages—to staff the more than 300 stations inside the archives; they became (and remain) curiously specific experts in parceled areas of research—deportations to the extermination camps, say, or displaced persons. Biedermann encouraged those who worked in “general documents” not to speak to those who worked in “concentration camp archives,” the “displaced persons files,” or the “TD files”—tracing and documentation—and vice versa. Almost nothing was digitized. Three years later, after I wrote a story on three slave-labor camps in the heart of Paris for the Jerusalem Report, I was invited to an “on background” meeting with a handful of officials at USHMM. Could I write about the archives? they wondered. Perhaps it would put pressure on the 11 governments to change the Bonn Accords and open the archives to researchers and modernization in time for survivors to see their files. Magazines hesitated to commit to an in-depth piece on an archive that I wasn’t allowed to see. And yet like many without access to Bad Arolsen, I couldn’t forget the archives. After the commission’s 2006 meeting in Luxembourg, it took two more years for the archives to open their doors. In the meantime, I began to petition the USHMM to allow me to accompany them to Bad Arolsen along with the first group of scholars selected to start research there—a trip eventually slated for the summer of 2008. After we packed up my grandparents’ house in northwest Massachusetts upon my grandmother’s death, I came across a box of letters marked “Patients’ Correspondence.” My grandfather had been a family physician in the United States after he fled Nazi-occupied Vienna. But inside the box I discovered not only letters from his patients in New York and Massachusetts but dozens upon dozens of letters from family and friends in Vienna, Berlin, Lyon, and Shanghai—all begging my grandfather, who had safely made it out, to cast the lifeline back and bring them over as well. About 50 of the collection were love letters. They were not from my grandmother. Written by a woman named Valerie Scheftel, the letters were baldly needy: She was desperately in love with my grandfather, and she was trapped in Berlin.